SpecAir Specialty Gases has a proud history as a family owned business, established in 1929. Parent company, Maine Oxy recognized the need to increase its market share in the specialty gas global arena. In 1996, SpecAir Specialty Gases was formed. Today, Spec Air is one of the largest independent cylinder gas companies in New England, as well as the only manufacturer of High Purity Acetylene and Industrial Acetylene in the region, servicing customers all over the world. 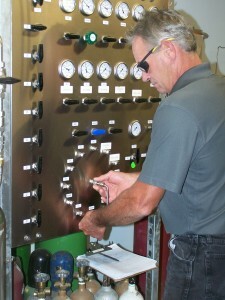 The SpecAir gas manufacturing laboratory, located in Auburn, Maine, is an ISO/IEC 17025:2005 accredited laboratory and production facility. SpecAir also introduced the Enviro-Cyl line of environmentally friendly refillable products, replacing disposable calibration gas cylinders with refillables. Extensive experience, expertise, plus a better understanding of the chemistry involved when mixing specialty gases makes Spec Air stand out in the industry. SpecAir Specialty Gases combines technology-driven products with value-added services to help grow your business.